It was with great pleasure that Yasmin Frampton, TAMT’s new tutor for all of the Junior Music Centre activities, collected a cheque from the Coop Communtiy Fund for £500. TAMT are very excited about the new opportunities TAJMC will offer the young future musicians of Thornbury and its surrounding areas. Yasmin is pictured above, collecting a cheque from the Thornbury branch. This is in addition to a £2000 grant which was awarded to the trust by the John Lewis Partnership to help establish the new activities. It may have been one of the hottest days of the year so far, and yes Andy Murray was playing in the final of Wimbledon, but the SCYO players kept their cool and spent the day working hard at the Movie Music ‘scratch orchestra’ day. Rehearsing from 1pm-6.30pm, there was a great variety of music to get through before the 7:30pm performance in Castle School, Thornbury. The SCYO will next be meeting in the Autumn term over a 3-week period, culminating in a concert featuring soloists from the orchestra and a full symphony. Further details can be found on the SCYO pages. Wow! Another great concert from all of the TAMC Groups. Last night, the groups really raised the roof of Castle School. With a near-capacity audience, we were joined by very special guests the Deputy Mayor of Thornbury and Steve Webb MP. There was a real mix of music. The Junior groups entertained in the first half of the concert, with a collection of tunes new and old. The Junior Wind, conducted by Trudy Monday opened the concert withthe ‘Colonel Bogey March’ with some spirited wind and brass playing. The Junior Strings, conducted by Janet Lewis, performed the ‘Dance of the Reed Pipes’, before combining with the wind to give a rousing rendition of the Mission Impossible Theme – no easy task as it’s in 5/4 time! With so many chamber groups now rehearsing at TAMC (6 at the last count), two were featured in the Summer Showcase. Our youngest string group performed Pachelbel’s Canon in D, before our oldest chamber group ‘The Octaves’ performed ‘Somebody that I used to Know’ arranged by TAMC violist Copper. The first half closed with the choir, ably accompanied by recorder soloist and ‘The Octaves’, performing Jenkins’ ‘Adiemus’. After the interval, the Seniors took to the stage. The strings began with an energetic version of ‘Pirates of the Caribbean’. Highlights of the second half included the Bach Double Violin Concerto with soloists Ruth and Emma, the Senior Wind performing ‘Shrek Dance Party’ and the strings getting all of the audience clapping their hands and stamping their feet to Ray Charles’ hit ‘Halelujah, I love her so’ with blues piano accompaniment. The concert closed with a performance of Debussy’s ‘Clair de Lune’ and Grieg’s ‘Peer Gynt Suite No.1′ by the Senior Orchestra conducted by Chris Sanders and Dury Loveridge. The Deputy Mayor and Work and Pensions Minister Steve Webb MP offered their support and words of encouragement to the players, and remarked what a great success TAMT has become in only a year. There were also certificates for the long-serving players leaving us for university this year, and words for Dury Loveridge who leaves his position coaching the TAMC Seniors to work more closely with the senior ensemble The South Cotswold Youth Orchestra. The new Senior Strings Tutor Kate Robey was welcomed, who looks forward to working with the strings next year. Just two weeks after the trip to the Music for Youth Festival, and the TAMC groups we in action again – this time showcasing their talents at an Easter concert at Thornbury Baptist Church. The first half of the concert featured the Junior Ensembles. The Junior Orchestra, now featuring more young instrumentalists than ever before, opened the concert with Handel’s Saraband & Variations with some fantastic rhythmic drive. The Junior Strings performed the Rogers & Hammerstein Classic My Favourite Things, contrasting nicely with the Junior Wind’s rendition ofHakuna Matatafrom ‘The Lion King’, before the two groups joined forces once more for a full-bodied performance of Weill’s Mack the Knife. There was then a short musical interlude from our talented chamber ensembles, who perform during the morning when the choir, music theory and musicianship classes take place. The Violin and Flute ensemble introduced and played Joplin’s The Entertainer and Faure’s Pavane,before ‘The Octaves’ (TAMC’s own String Octet) continued their Adele theme this year withRolling in The Deep. The latter half of the concert featured the Senior Ensembles. The Senior Strings performed I Dreamed a Dream from ‘Les Mis’ lead without conductor by Emma, and then a great arrangement of Adele’s Skyfall from the latest Bond movie – complete with drum kit and special violin and cello solo interjections from Emma and Fred. The Wind Band performed Fernie’s The Greatest Show on Earth with enthusiasm and gusto before the concert closed with a section of Offenbach’s Orpheus in the Underworld by the Senior Orchestra. A great morning – and it was brilliant to see the Baptist church once again full to capacity. Thank you to all who took part, watched and supported the Trust this term. We went to a Music for Youth Festival! It was an early 8am start for the coach in Thornbury as two coaches took the TAMC and the AMS musicians to Cheltenham. They were just a few of the 50,000 young musicians who take part in the festival across the country, which is a showcase for talented groups and innovative performances. In the morning session the TAMC Senior Strings performed Adele’s Skyfall and I Dreamed a Dream from ‘Les Mis’ in a brilliant performance including a guest pianist and kit player winning praise for the ‘strong string sound’. The TAMC Junior Orchestra, including ‘student mentors’ from the seniors were praised highly for their ensemble and enthusiasm. Finally the TAMC Senior Wind Band performed two pieces from their repertoire, to great enthusiasm from the audience and MFY Mentors. Staff from neighbouring music services and schools wanted to pass on their congratulations on such a strong showing from a centre which only started 6 months ago, and for the various solos which featured. At lunch the TAMC Musicians went home, and the AMS performers got ready for their classes. The South Cotswold Youth Orchestra was praised highly for its performance of Fred Moore’s own composition ‘Last Man Standing’ which featured ferocious drumming from Josh. They also performed Radetsky March and had the audience clapping along. The String Orchestra was prased for its ‘balanced string sound’ and ‘impressive opening’ to Grieg’s Holberg Suite and The St Paul’s Suite, before the Wind Orchestra played part of Bach’s The Art of Fugue and Doug Lorenz’s (!) Uptown Midtown leaving only percussionist Josh and conductor Chris Sanders on the stage to take the applause and the praise form the mentors for their ‘great ensemble skills and watching of the conductor’. As if the performances weren’t enough, the players had a fantastic opportunity to watch their peers from neighbouring areas play. There were brass and saxophone quintets and small ensembles, choirs, and a brilliant massed-cello ensemble. I’m sure all of the players went home inspired to practice hard! Below are the 6 certificates TAMT returned home with, one for each group. Click on the picture for the full size version. We’re off to a Music for Youth Festival! This year, 6 TAMT groups have been accepted to take part in the Music for Youth Regional Festival in Cheltenham, on Sunday March 3rd. From TAMC, the Junior and Senior Orchestras, along with the Senior Band will be performing in the Music Centres categories in the morning session. In the afternoon, the three AMS ensembles, The South Cotswold Youth Orchestra, String Orchestra and Wind Bands will be performing in the ‘open’ category (for groups up to age 21). The Regional Festvial Series is the gateway to the MFY Season. Throughout February and March around 50,000 young musicians take part. Regional Festivals provide a unique opportunity for groups to perform to new audiences, listen to other groups from their area and get valuable feedback from the team of MFY Music Mentors. From the Regional level, various groups are selected for their ingenuity and innovation to go on to play at the National Festival (Birmingham’s Symphony Hall), and ultimately at the National Schools Prom in the Albert Hall. In previous years TAMT tutors have had experience of entering groups at various Regional Festivals, including Trowbridge, Cwmbran and Cheltenhan, and of directing groups at the National Festival in Symphony Hall. It really is the highlight of the musical year and a fantastic opportunity for any young musician, and their tutors! Below is a short video posted by Music for Youth with more information about the series. 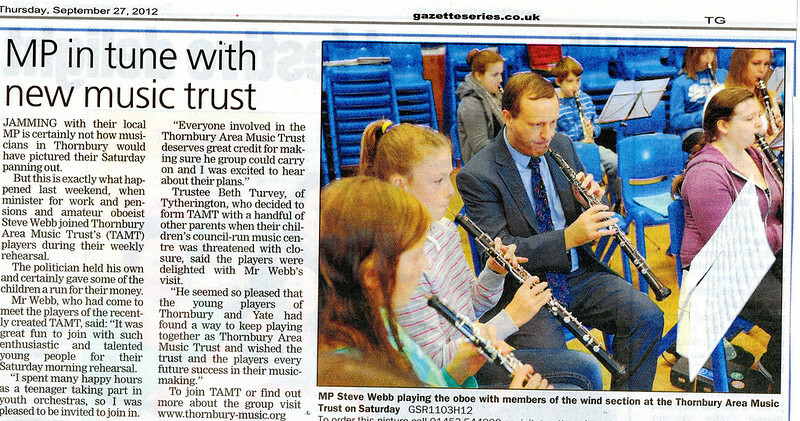 Steve Webb MP joins the oboe section! Thornbury Area Music Centre had two special VIP’s visiting this morning. After a quick appearance on Radio Bristol’s Saturday Breakfast show alongside TAMT’s own Beth Turvey, Steve Webb MP joined TAMC for the second rehearsal of the year. Steve is the Liberal Democrat MP for Yate and Thornbury, and is currently Work and Pensions Minister. He has been a supporter of the setting up of TAMT and revealed he’s also a grade 8 oboist. Steve brought his oboe with him and joined Thornbury Music Centre, visiting each group, playing with the senior and Junior Wind Bands, and chatting with staff and pupils alike. He seemed so pleased that the young players of Thornbury and Yate had found a way to keep playing together as Thornbury Area Music Trust, and wished the Trust and the players every future success in their music-making. Also visiting us this morning was a representative from the Quartet Foundation. TAMT were lucky to receive a generous grant from the Quartet Foundation to help with set-up costs and to create new opportunities for the musicians of South Gloucestershire. They had a quick tour of each group, and gave a spontaneous round of applause to the Senior Orchestra as they sight-read their way through a Strauss Polka! We were delighted to be joined by even more new players this weekend – the cello section in particular! The chamber ensembles got off to a good start this morning, including a gentle playthrough of a Mozart String Quartet, and the remaining pupils have now chosen their post-break activities, with a nice balance of numbers for choir, theory and musicianship. What a busy morning! The Senior Orchestra were making an amazing sound. Below is the local Gazette’s article covering the morning. Wow! What a great first morning! 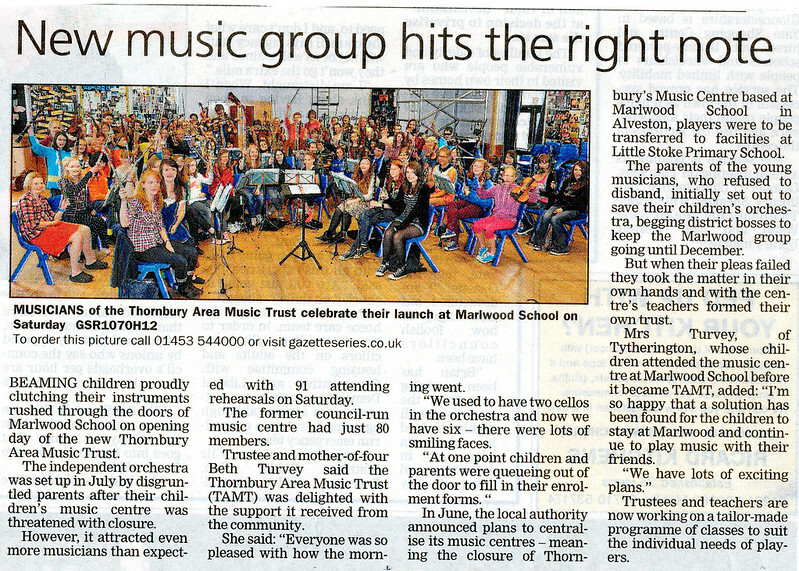 The first TAMT-run Thornbury Area Music Centre rehearsal was on Saturday September 15th. It was great to see such a high turnout – at one point children and parents were queuing out the door to fill-in their enrollment forms! There are already over 80 young musicians from across South Gloucestershire committed to learning with TAMT, with players also signing up fast for the AMS Programme – it’s going to be a strong group of players indeed! The number of players in each group have risen dramatically. The Senior String Ensemble, for example, has doubled in size. The buzz amongst the children and young musicians at the break time tuck shop was amazing, as many caught up with friends they hadn’t seen since the summer tour to Holland. There are some fantastic music selections this term. The Senior Band were working hard at a selection from Phantom of the Opera, whilst down the corridor the Senior Strings were playing Grieg’s Holberg Suite with gusto! As if that wasn’t enough, there was some African singing from the choir at break before the orchestra set to work on a Lion King medley and Elgar’s Pomp and Circumstance No.4. All of the groups are already sounding pretty good, especially after a quick limbering up with scales and other warm-ups(! ), and I think everyone is excited to see how everything is going to sound in December’s concert. Watch this space!